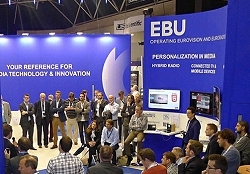 EBU to showcase broadcast technologies at IBC. Geneva, August 2016: Virtual reality (VR), High Dynamic Range (HDR) and High Frame Rates (HFR) are just some of the European Broadcasting Union’s (EBU) latest achievements in media technology and innovation that will be showcased at the International Broadcasting Convention (IBC) in Amsterdam from 9-13 September. A new online platform for FIMS open source development will be available and visitors will be shown how EBU Sport and its use of semantic data can easily link resources to event data and much more. The EBU will also demonstrate the on-demand delivery of an immersive documentary about a football school in Porto, together with its ImmersiaTV partners including Flemish Belgian Member VRT. The documentary is based on omnidirectional content that is synchronously delivered across multiple household devices including a head mounted display, television and second screen tablets. Better pixels are defined not only by an increase in their number (i.e. higher resolution). Both Higher Dynamic Range (HDR) and High Frame Rates (HFR) provide a noticeable increase in their immersive image quality. This year’s demonstration will show HDR and HFR enhancements broadcast via DVB-T2 and as an online delivery with DASH. The IBC is an unrivalled global destination for discussion and debate about the many different challenges facing the electronic media and entertainment industries. As part of this rich heritage, the EBU will host both a Cybersecurity and ‘Strategies for Media Companies’ Session from 15:30 – 18:00 (Room Emerald) and its annual EBU Open Source Meet-up at the EBU Stand from 16:30 – 18:00 (10.F20) on Saturday, 10 September.